Food businesses which supply human food repurposed as animal feed are being reminded to comply with Hygiene Regulations to prevent outbreaks of disease such as African swine fever, following the arrival of the disease in Europe in the summer. The warning comes as the risk level of African swine fever in the UK has been raised after new European outbreaks. It is illegal to feed catering waste of any description to farm animals in the UK and any food businesses who do supply human food to animals must be registered with their local authority and comply with the requirements of the Feed Hygiene Regulation (Regulation EC No.183/2005). Any unprocessed product of animal origin and products containing ruminant gelatine or collagen. Ensuring systems are in place for segregation during collection, transport and storage of feeds eligible for farm animal feeding from those that are ineligible. Ensuring staff are fully trained to make them aware of what can and cannot be sent for animal feed and the separation requirements. The introduction of African swine fever could have an enormous impact on our pig industry. If businesses that supply human food stuffs for animal feed ensure they comply with the Feed Hygiene Regulation, they will be making a vital contribution to minimising the risk of disease to UK pig herds. The health of our pigs is fundamentally important to our sector. A notifiable disease outbreak would not only needlessly result in the loss of many pigs and annihilate our burgeoning export market, but would significantly impact on countless families, their staff, local businesses and tourism for months. Feeding illegal food waste, however harmless it might seem at the time, is just not worth the risk. 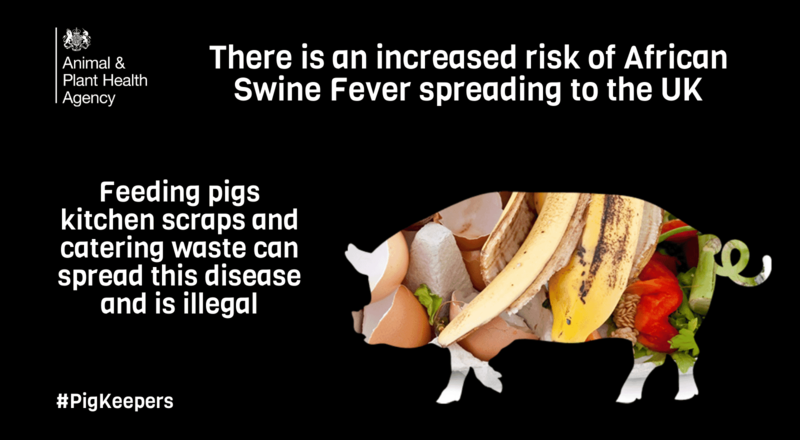 While there has never been a case of African swine fever in the UK and it does not affect humans, it is potentially fatal to pigs. It could therefore have a devastating effect on our export market and would also mean the humane culling of pigs on infected premises to prevent further spread. The UK suffered the consequences of pigs being fed illegal waste food in the foot and mouth disease outbreak in 2001. That outbreak is thought to have originated from pigs being fed catering waste containing the virus, which came from outside the UK. The outbreak resulted in the destruction of more than 10 million cattle and sheep and cost the UK many millions of pounds. Companies found providing illegal food materials for inclusion in animal feed may be prosecuted which could result in an unlimited fine and up to two years imprisonment. As reported by: Animal and Plant Health Agency, Defra, Welsh Government, Scottish Government, The Department of Agriculture, Environment and Rural Affairs Northern Ireland, The National Pig Association, The British Pig Association, The Pig Veterinary Society, The British Veterinary Association and Agriculture and Horticulture Development Board (AHDB) Pork.